#A041 Primitive Stitchery Pattern " Winter Mittens!" 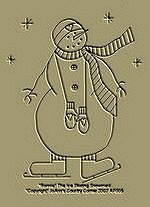 Primitive Stitchery Pattern,Primitive Snowman "Winter Mittens!" #A040 Primitive Stitchery Pattern "Families Are Forever!" Primitive Stitchery Pattern, Primitive Snowman "Families Are Forever!" #A042 Primitive Stitchery Pattern "Let's Go Skating"
Primitive Stitchery Snowman Pattern "Let's Go Skating!" 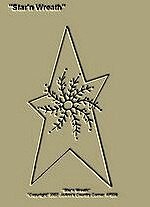 #A043 Primitive Stitchery Snowman Pattern "Reach For The Stars!" 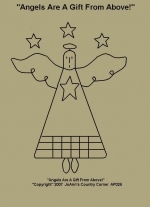 Primitive Stitchery Snowman Pattern "Reach for the Stars!" #A046 Primitive Stitchery Pattern "Winter's Laundry, North Pole!" 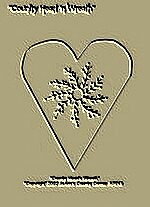 Primitive Stitchery Pattern "Winter's Laundry!" #A050 Primitive Stitchery Pattern " Friends Forever!" Primitive Stitchery Pattern "Friends Forever". #A051 Primitive Stitchery Pattern "Sledding Buddies"! 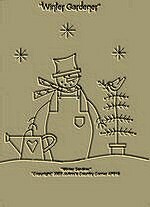 #A052 Primitive Stitchery Pattern"Winter Gardner"! 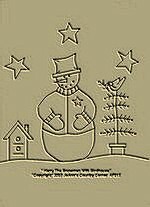 #A053 Primitive Stitchery Pattern- "Harry The Snowman With Birdhouse"
Primitive Stitchery Pattern"Harry The Snowman With Birdhouse"
#A054 Primitive Stitchery Pattern - "Think Snow Snowman"! 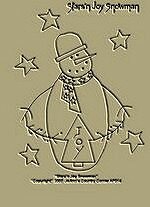 Primitive Stitchery Pattern "Think Snow Snowman"
#A055 Primitive Stitchery Pattern - "Stars'n Joy Snowman" ! 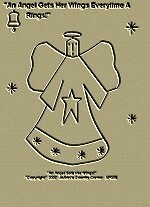 Primitive Stitchery Pattern "Star'n Joy Snowman"
#A056 Primitive Stitchery Pattern- "Country Heart'n Wreath"! 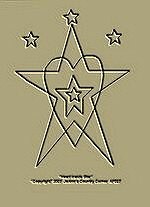 Primitive Stitchery Pattern"Country Heart'n Wreath"
#A060 Primitive Stitchery Pattern "Star'n Wreath"
Primitive Stitchery Pattern "Star'n Wreath!" 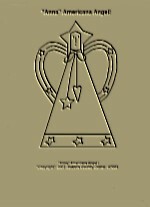 #A061 Primitive Stitchery Pattern "Heart Inside Star"
Primitive Stitchery E-Pattern "Heart Inside Star"! 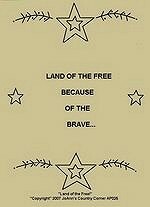 #A062 Primitive Stitchery Pattern"Land Of the Free"
#A063 Primitive Stitchery Pattern-Prim "Ewe Tide"
"Ewe Tide!" AP024 Pattern measure�5 3/4" x�9 1/2".